Living in an ocean of corruption and scams and fighting against it alone at the risk of dismissal and other actions. Crucified by the system followed by resurrection. This is my real life story – a true story of an ex- senior audit officer of the Indian Audit and Accounts Department headed by the CAG of India. It contains my Anti-Corruption activities and fight against many malpractices prevailing in the CAG department as also in other departments. It also reveals the reactions from the department like disciplinary actions etc. against me and how I fought it and continued with the rebellion unabated. The main aim of this book is to give inspiration to others whom I had heard saying, "corruption is everywhere, it is an unavoidable evil of underdeveloped countries and what we can do?" The book is also aimed at revealing the truth to the public who treat CAG as an incarnation of god, but in reality it is not god but a FRAUD as is the name of the book indicates. It is also an attempt to show that what is submitted to the Parliament and the State Legislatures by the name 'CAG AUDIT REPORT' is full of fake and imaginary audit objections and genuine objections are not reported except in circumstances detailed in the book. It also reveals why the coalgate scam, 2g scam etc., came to light only after decades of its occurrences. Part I of the book starts with the heading 'CAG NOT EVEN AN ACCOUNTANT'. Then a very interesting historical incident from my own experience is unfolded to establish that cag is not even an accountant. From the 2nd chapter onward the author is unfurling his experiences in the audit side in support of the title of the book, starting with a quote from a decision of the Supreme Court of India while dismissing a Public Interest Litigation (PIL) based on an audit objection (Draft Para) reported by the CAG in his Audit Report submitted to the Parliament. Finally, chapter 14 of the book is ending with, "is it not both CAG and the Ministry is fooling the Parliament and thus the people of India? Now it is for the Public Accounts Committee (PAC) of the Parliament to tell the public what they are doing with these kinds of audit objections and replies brought before them". 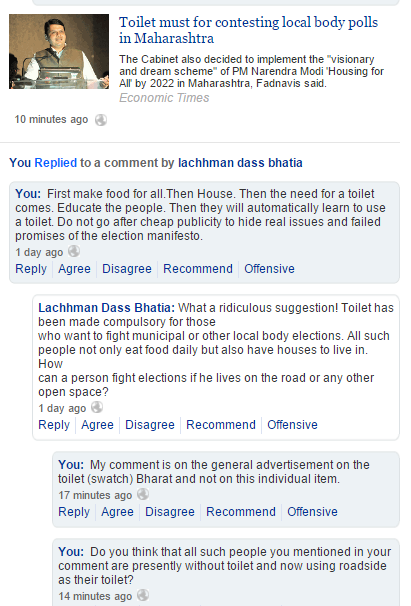 Swachh Bharat Abhiyaan - स्वच्छ भारत अभियान‎ a cheap publicity? The Swachh Bharat Abhiyaan - स्वच्छ भारत अभियान is going at a speed along with 'giving up gas subsidy'. In this connection one of my recent comment/reply in the Economic Times is attached herewith. 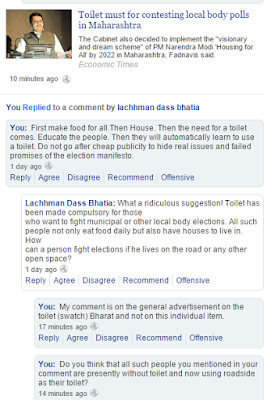 It is self explanatory of my idea that it is a cheap publicity for diverting attention from main issues. After 20-25 years, there will be a CAG audit objection on this scheme similar to 2G/Coalgate scams surfaced after about 20 years (Ref: my book 'A FRAUD IN THE INDIAN CONSTITUTION).